cardigans and kids: Valentine love number 1 (and a cookie recipe). 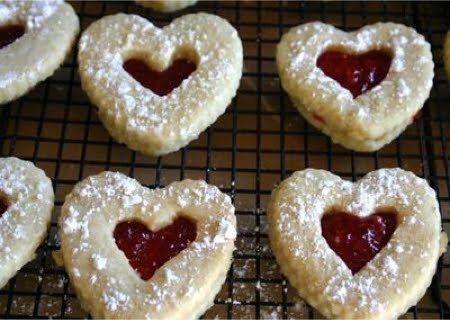 Valentine love number 1 (and a cookie recipe). The kids and I are preparing to head out of town for a couple of days. We are going to the edge of Kansas to celebrate my Grandma's 87th birthday. Since the blueberry banana cake and cream cheese frosting is ready to load and I am close to being packed... I thought I would take a few moments to begin sharing some of my valentine inspiration for this year. In a large bowl beat butter with an electric mixer on med.-high speed for 30 seconds. Add sugar and salt and beat until combined. Add egg yolks, lemon juice, and vanilla. Beat until combined. Add flour and beat until combined. Cover and chill for 2 hours or until easy to handle. On a lightly floured surface, roll out the dough 1/4 in. thick. Cut with a cookie cutter. With half of the cut-outs, use a smaller sized cookie cutter, or a knife, and cut out the center. Place 2 in. apart on ungreased cookie sheet. Bake at 350 for 12-15 minutes, remove from the oven before the edges brown. Cool on a cooling rack, powder sugar the top cookie (the ones with the cut-out centers). Add 1 tsp. jam to the center of the bottom cookie. Place together to form sandwich cookies. You can make the cookie dough ahead and freeze in a freezer for up to 1 month (thaw in refrigerator). Store filled cookies in a storage container at room temperature up to 2 days. They look so good, I will be giving them a try. Sadly, Valentines pretty much passes us by here, my husband is away every year at a conference, perhaps I need to give him a gentle reminder this time? Hi Beth, Mat and I really don't exchange much either, but it is a reason to make something yummy for for family and friends. :) I hope you enjoy them. Birthday wishes to your Grandma - 90 is amazing! Such a delicious sounding post! Hope you have a wonderful time with your grandmother this weekend! Thanks Amanda. It is good to hear from you. Lily and you are quite a lovely mother/daughter team. It is always fun to see what you have been up to.